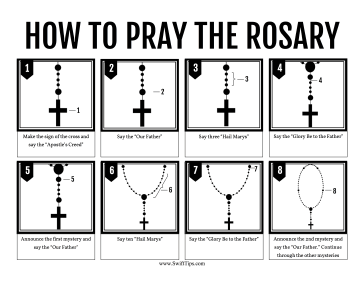 Catholics who pray the rosary can make sure they know what prayers go with which bead using this printable prayer guide. These printable SwiftTips are easy to download, customize, and print. These printable tip sheets are available in PDF format. Just download a template, open it in a PDF reader, and print it. If you don't see a SwiftTip or category that you want, please take a moment to let us know what you are looking for.